Thicker at the centre than at the edges. 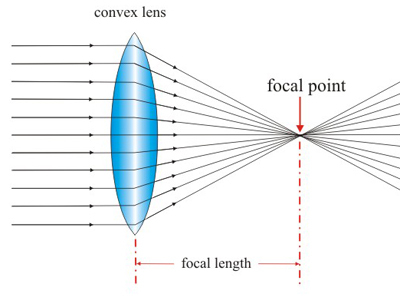 Distance between the focus point and centre of lens = focal length. Thinner at the centre than at the edges. and appear to come from a point, called the principal focus. distance between principal focus and centre of lens = focal length. How can we understand how lenses work? Consider the way light bends when it passes through glass blocks: Look at each block individually – and then see what happens when we put them together. Real image rays really come from the object, and focus at a point. We see it with our eyes – more importantly, if we put a piece of paper at that spot, an image would form there. If we put a camera lens there, it’d capture an image. The rays of light actually exist there. Virtual images are only seen by looking into the optics, and they can not be projected. Here, our eye sees rays of light as if they are coming from the region with the big yellow arrow. But no light is coming from there at all! If we put a camera there, no image would form. Consider a plane mirror. Light does not actually pass through from the other side of the mirror; it only appears as if it comes from there. The light rays form a real image at the focus. These rely on the same optical glass lenses that we see above. But instead of capturing the image on film, the image is captured on very small solid-state electronic sensors. Given the small size of cell phones, cell phone cameras have extremely tiny lenses, and small sensors. This puts them at a tremendous disadvantage compared to full size cameras. All things being equal, cell phone cameras should do a terrible job. Yet in recent years, engineers, mathematicians and coders have made amazing progress in allowing these tiny cameras to take some amazing photographs. They use mathematical and computer science techniques to analyse the data, and create a photo far better than one might otherwise expect. This article explains how. The human eye resembles a (complex and sophisticated) camera in its basic functioning. Has an adjustable lens, iris (aperture), and retina (detector). Near point: closest distance at which eye can focus clearly. For most people the near point is about 25 cm. A magnifying glass (simple magnifier) is a converging lens. It allows us to focus on objects closer than the near point, so that they make a larger, and therefore clearer, image on the retina. When the arrow is moved to a particular distance behind the glass, it looks like it reversed itself. When light passes from one material to another, it can bend or refract. Here, light traveled from the air, through the glass, through the water, through the back of the glass, and then back through the air, before hitting the arrow. Anytime that light passes from one medium, or material, into another, it refracts. Just because light bends when it travels through different materials, doesn’t explain why the arrow reverses itself. To explain this, you must think about the glass of water as if it is a magnifying glass. When light goes through a magnifying glass the light bends toward the center. Where the light all comes together is called the focal point, but beyond the focal point the image appears to reverse because the light rays that were bent pass each other and the light that was on the right side is now on the left and the left on the right, which makes the arrow appear to be reversed. A refracting telescope consists of two lenses at opposite ends of a long tube. 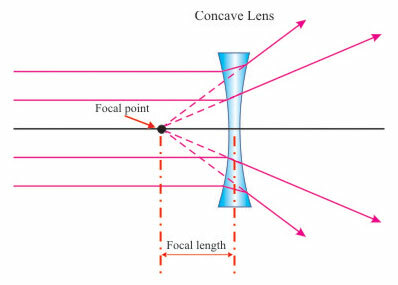 The objective lens is closest to the object, and the eyepiece is closest to the eye. Astronomical telescopes need to gather as much light as possible. • And obtain the sharpest view possible. • The objective must be as large as possible. • Mirrors are now used instead of lenses, as they can be made much larger. • Refractors consist of an objective lens and an eyepiece lens. • A terrestrial telescope, used for viewing objects on Earth, should produce an upright image. How do compound microscopes work? Example of severe chromatic aberration. All optical lenses produce some aberration. Using physics, camera makers design lenses to minimize this effect, but depending on the focal length of the lens, and distance to your subject, this phenomenon can show up in any camera. HS-PS4-3. Evaluate the claims, evidence, and reasoning behind the idea that electromagnetic radiation can be described by either a wave model or a particle model, and that for some situations involving resonance, interference, diffraction, refraction, or the photoelectric effect, one model is more useful than the other. HS-PS4-5. Communicate technical information about how some technological devices use the principles of wave behavior and wave interactions with matter to transmit and capture information and energy. Emphasis is on qualitative information and descriptions. Examples of principles of wave behavior include resonance, photoelectric effect, and constructive and destructive interference. When a wave passes an object that is small compared with its wavelength, the wave is not much affected; for this reason, some things are too small to see with visible light, which is a wave phenomenon with a limited range of wavelengths corresponding to each color. When a wave meets the surface between two different materials or conditions (e.g., air to water), part of the wave is reflected at that surface and another part continues on, but at a different speed. The change of speed of the wave when passing from one medium to another can cause the wave to change direction or refract. These wave properties are used in many applications (e.g., lenses, seismic probing of Earth)… the wavelength and frequency of a wave are related to one another by the speed of travel of the wave, which depends on the type of wave and the medium through which it is passing. The reflection, refraction, and transmission of waves at an interface between two media can be modeled on the basis of these properties… At the surface between two media, like any wave, light can be reflected, refracted (its path bent), or absorbed. What occurs depends on properties of the surface and the wavelength of the light…. Lenses can be used to make eyeglasses, telescopes, or microscopes in order to extend what can be seen. The design of such instruments is based on understanding how the path of light bends at the surface of a lens.